This site is the home of Chad, Jen, Molly, and Leah Sellers. 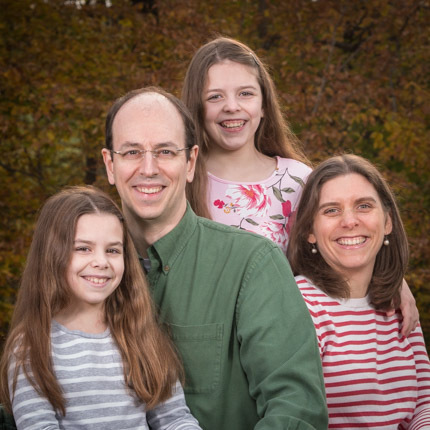 We currently reside in Columbia, MD, where we’ve lived since 2003 (well, Molly didn’t come along until 2007, and Leah until 2009, but you get the idea). We are Christians, and very involved in our church, Glen Mar United Methodist Church. If you’re interested in more of our background, check out the History page. If you’re looking to get in touch with us, check out the Contact page. Chad currently has 2 jobs. He spends his days at Tresys Technology, which you may have heard of (if you’re a geek like Chad) for their work with Security-Enhanced Linux. By night, he runs his own Mac software development company, Useful Fruit Software, which released its first product, Pear Note, in 2008. Jen also owns her own small business, Little One Originals, creating hand-made children’s accessories, although most of her time is spent with Molly and Leah. Going to playdates and toddler classes, taking walks around Lake Elkhorn, and having “jammie days” at home fill up their weekly calendar! Jen enjoys cooking, especially desserts, and when she has some free time enjoys reading, sewing, and cross-stitching. Molly is a very happy little girl. She loves to dance to all kinds of music. She also plays her own music on her keyboard, guitars, and drum, but the best is when Daddy lets her play along with him on his guitar and drum! Her favorite songs to sing are “The Itsy Bitsy Spider” and “Mary Had a Little Lamb.” But her favorite thing is to do is read! She has started memorizing a few of her books, and can “read” them along with Mommy and Daddy. Leah joined our family September 16, 2009. Currently, her favorite things to do are eat, sleep and poop! Molly is doing great as a big sister. she likes to “hold” Leah (using the Boppy) and read to her. We also get a running play-by-play of what Leah is doing and if she is crying we “have to make her feel better.” We are excited to have two girls and hope they grow up to be the best of friends.